Driving a car onto a conveyor belt sometimes causes anxiety. However, maneuvering a car onto the conveyor track at Jet Pro Auto Wash is easy. An attendant helps direct as you slowly drive towards the conveyor track. A correlator will guide you into the perfect position and onto the conveyor. Once your car is in place, put the car in neutral and enjoy the four-minute ride. 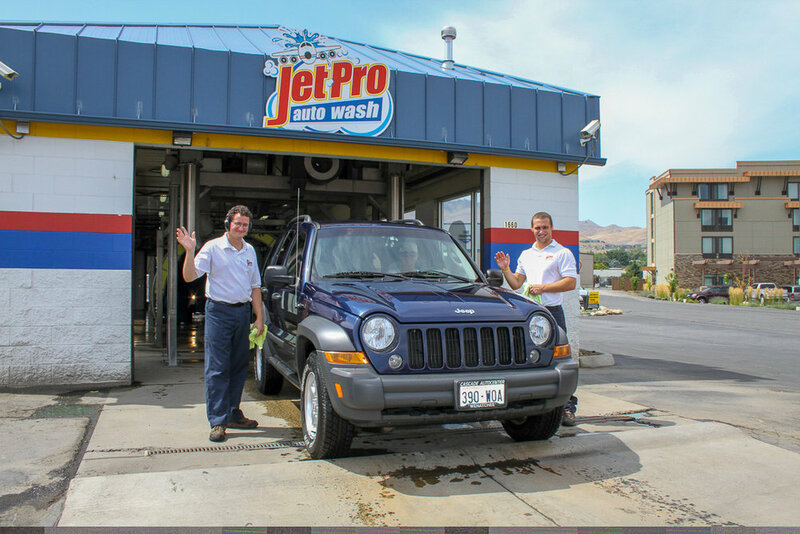 Before rolling into the Jet Pro Auto Wash system, attendants prepare your car for take off. A pre-soak rinses the front bumper, windshield and grill of your vehicle, a damp cloth is given to you to clean the interior, attendants clean the windows with squeegees and your antenna is removed. Your car is now ready to enter the Jet Pro Auto Wash system. Jet Pro Auto Wash uses a cloth friction system to clean all vehicles. Cloth friction consists of a series of soft cloths that moves around the car to remove dirt and grime. Soap foamer is applied to your vehicle. This serves as a detergent and becomes a deep-cleaning product. The mitten curtain is made up of long strips of cloth that hang overhead. The strips move back and forth across the horizontal surfaces of your car. Large vertical cylinders rotate while cleaning the front, sides and rear of your vehicle. High pressure jets are strategically positioned to spray the wheels many times and at many different angles as the wheel moves down the conveyor. This special treatment removes brake dust, mud and debris leaving beautiful, clean wheels. The undercarriage rinse and rust inhibitor system is located at ground level and has several nozzles pointed upward. The undercarriage wash will remove any build-up or salt that may have occurred in hard-to-reach places. High-pressure water sprays streams of water onto the car to rinse away dirt and keep your car wet throughout the wash system. Large vertical cylinders rotate while cleaning the sides of your vehicle. A tri-colored wax formula is applied. A sealant is applied to provide extra protection to your vehicle's finish. Our reverse osmosis water processing assures you of a spot free rinse while aiding the drying process. Rain-X surface reactive polymer molecules bond and stick to your vehicle's paint, glass and trim. After 24-hours Rain-X cures onto these surfaces for greater shine, longer lasting performance and enhanced protection. A series of dryers removes most of the water. Dryers are pointed toward the top and sides of your car. 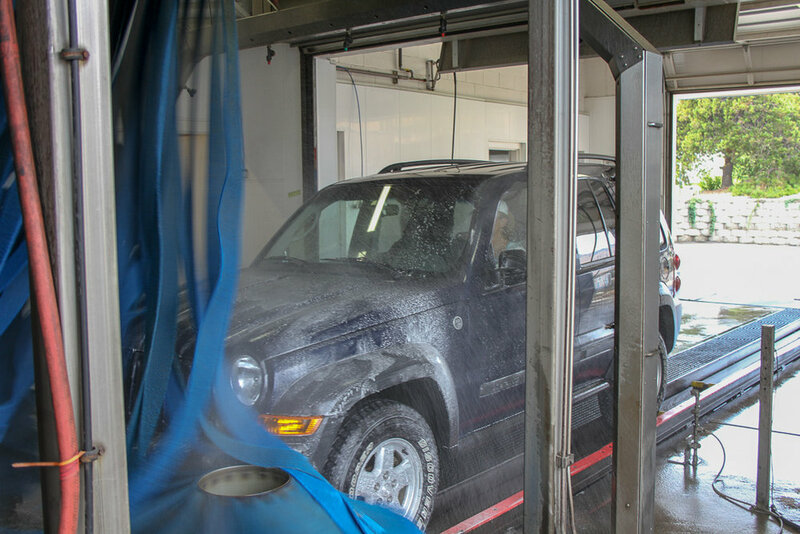 The last step in the Jet Pro Auto Wash system is the touch-up. After the dryer finishes, pull your car out until advised to stop. An attendant will finish drying your vehicle with a cloth and attach the antenna. You're ready to take your clean car to the road! Two self-serve vacuum islands provide the latest technology in vacuuming, upholstery cleaning and fragrance sprays. The Hanna Car Wash System provides the most reliable, efficient car wash equipment in the industry.